Married Name 1932 As of 1932,her married name was Alt. Hilda M. Ringelstetter was born on 20 March 1903 at Sauk, Wisconsin, also reported as 20 Mar 1902. Hilda M. Ringelstetter witnessed the marriage of Herman Joseph Ringelstetter and Mary Barbara Lehner on 7 May 1919; On Wednesday morning, May 7th, 1919, at 10 o'clock, at St. Luke's church, Plain, occurred the marriage of Mr. Herman Ringelstetter and Miss Marie Lehner. Rev. Father Surges officiated. The bridesmaid was Miss Hilda Ringelstetter, sister of the groom, and Mr. Joseph Lehner brother of the bride, was groomsman. The bride is the daughter of Mr. and Mrs. Bartholomew Lehner and a young lady of splendid qualities. The groom is the son of Mr. and Mrs. Andrew Ringelstetter, a young man of sterling character and worth. After the ceremony a reception was held at the home of the bride's parents, the guests being immediate relatives of the bride and groom. After the reception the young couple departed on a trip to Milwaukee and Holy Hill. On their return they will be at home on the farm of the groom near Spring Green. Mr. and Mrs. Ringelstetter have the hearty good wishes of a host of friends. 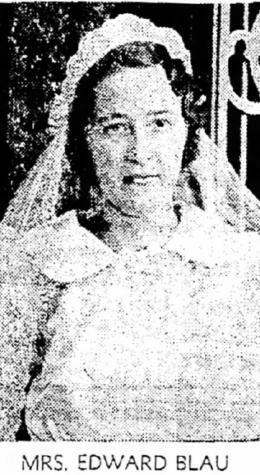 Hilda M. Ringelstetter married Leo J. Alt, son of Joseph Alt and Rose Gruber, in 1932. Hilda M. Ringelstetter died in October 1986 at Sauk, Wisconsin, at age 83. [S250] U.S. Federal Census 1930 U.S. Federal Census, by Ancestry.com, Year: 1930; Census Place: Troy, Sauk, Wisconsin; Roll: 2609; Page: 6A; Enumeration District: 37; Image: 482.0. Edith I. Phetteplace married Joseph M. Alt, son of Michael Alt and Catherine Pletzer. Edith I. Phetteplace was born in 1917 at Wisconsin. She was the daughter of (?) Phetteplace and unknown (?). Edith I. Phetteplace died on 8 February 1976. Name Variation Wilbert A. Gruber was also known as William. Name Variation Wilbert A. Gruber was also known as Bill. Name Variation Wilbert A. Gruber was also known as Wilburt. Wilbert A. Gruber was born in 1923 at Wisconsin. He was the son of Alois Joseph Gruber and Clara Mary Pulvermacher. 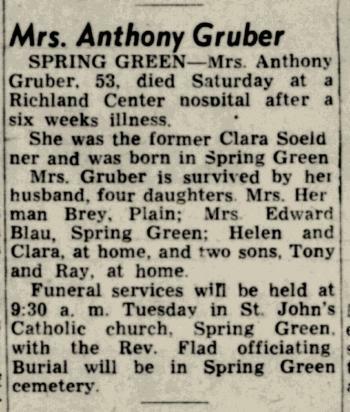 Wilbert A. Gruber married Mary Ann Roessler, daughter of Anthony James Roessler and Apollonia G. Schmitz, on 6 February 1947. 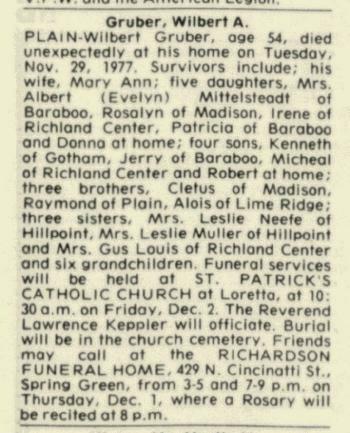 Wilbert A. Gruber died on 29 November 1977 at Plain, Sauk, Wisconsin, Wilbert Gruber obituary. 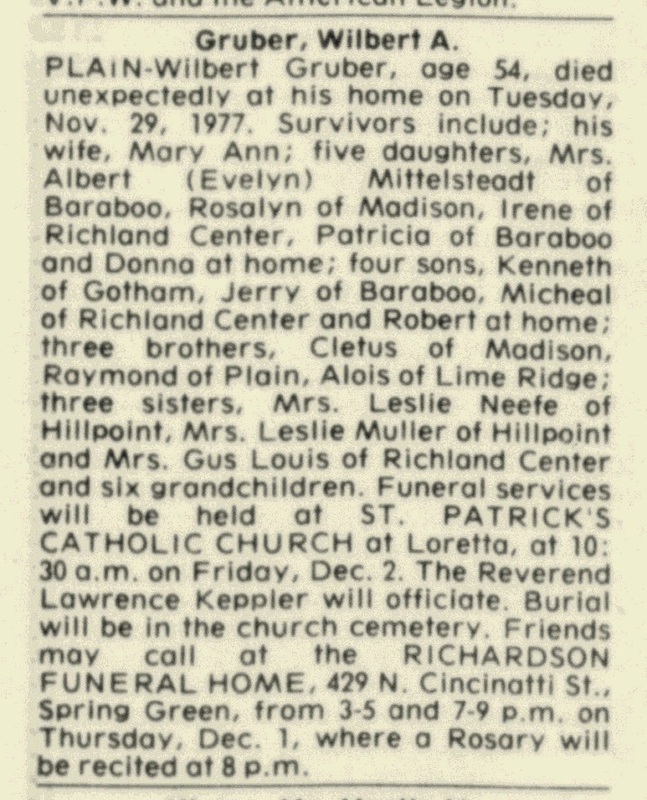 He was buried after 29 November 1977 at St. Patrick's Catholic Cemetery; New Loreto, Bear Creek, Sauk, Wisconsin. [S250] U.S. Federal Census 1930 U.S. Federal Census, by Ancestry.com, ED8. Dwelling 117. Name Variation Victor A. Gruber was also known as Vic. Victor A. Gruber was born in 1926 at Wisconsin. 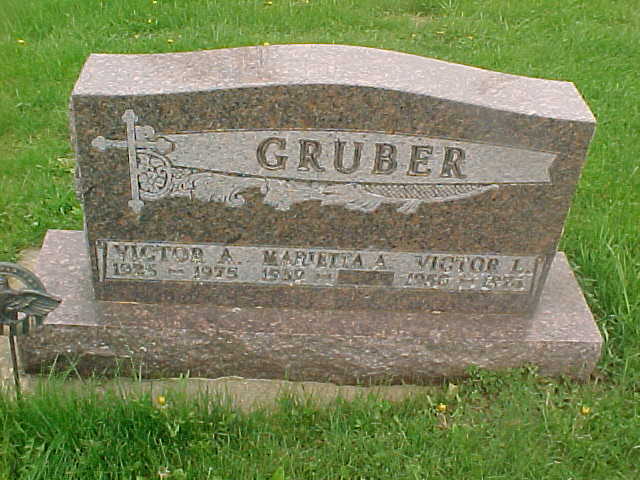 Victor A. Gruber was buried in 1975 at St. Patrick's Catholic Cemetery; New Loreto, Bear Creek, Sauk, Wisconsin. Married Name Her married name was Neefe. Name Variation Agatha Gruber was also known as Sis. 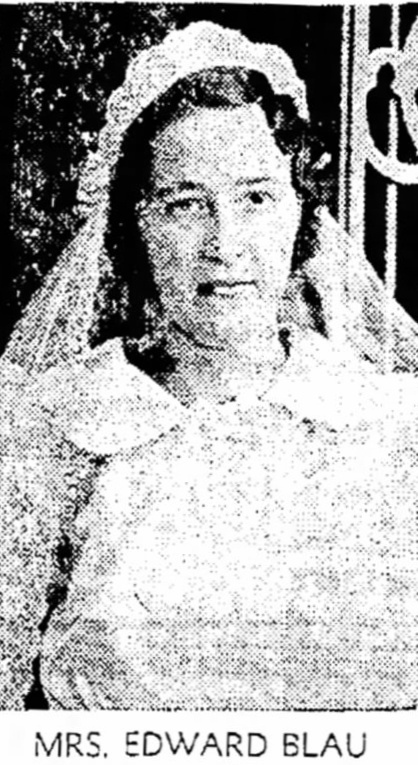 Agatha Gruber married Leslie Neefe. Agatha Gruber was born circa 1929 at Wisconsin. She was the daughter of Alois Joseph Gruber and Clara Mary Pulvermacher. Agatha Gruber died after 1977. Victor L. Gruber was born in 1958. He was the son of Victor A. Gruber. 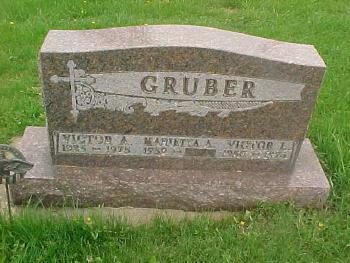 Victor L. Gruber was buried in 1974 at St. Patrick's Catholic Cemetery; New Loreto, Bear Creek, Sauk, Wisconsin. Christine Meixelsperger married William J. Gruber, son of Alois Joseph Gruber and Josephine Hartl. Christine Meixelsperger was born in 1903 at Wisconsin. She was the daughter of John Meixelsperger Sr. and Margaret Hutter. Christine Meixelsperger died in 1975. Laverne A. Gruber was born in 1930 at Wisconsin. Laverne A. Gruber died in 1950 at killed in action - Co. A 1st Bn 5th Calv Reg, Korea. Name Variation LeRoy Gruber was also known as Leslie. Name Variation LeRoy Gruber was also known as Sam. LeRoy Gruber was born circa 1937 at Wisconsin. LeRoy Gruber died on 22 March 1995. Alvin Johnson married Alma (?). Alvin Johnson died before 2005. Alma (?) married Alvin Johnson. Alma (?) died before 2005. Barbara K. Gruber was born on 27 November 1958. She was the daughter of LeRoy Gruber. Barbara K. Gruber died on 26 April 2005 at age 46 Barbara K. Gruber, age 46, of Baraboo, and formerly of Plain, passed away unexpectedly on Tuesday, April 26, 2005, at her residence. She was born on Nov. 27, 1958, to LeRoy "Sam" and Delores (Johnson) Gruber. Barbara graduated from the River Valley High School in 1976. Barbara moved to California, for her job with Cuna Mutual Insurance Co., then to Nashville, before moving back to Baraboo in 1995. Survivors include her mother, Delores Gruber and Edward Vodak of De Soto; a brother, LeRoy (Diane) Gruber of Plain; a sister, Christy Gruber and Mike Gratz of Plain; a brother-in-law, Gary Snowadzki of Plain; nieces and nephews, Dan, Michael, Hailey, Hannah and Samara Gruber, Sadie (Tom) Hooks, and Leslie and Andrew Snowadzki; her special friend of 15 years, Walter McMillan of Baraboo; many other relatives; and friends. She was preceded in death by her father, LeRoy "Sam" Gruber; a brother, Dan Gruber; a sister, Brenda Lee Snowadzki; her maternal grandparents, Alvin and Alma Johnson; and her paternal grandparents, Bill and Christine Gruber. A Mass of Christian Burial will be held on Friday, April 29, 2005, at 11 a.m. at ST. LUKE'S CATHOLIC CHURCH, Plain. Father Mike Resop will officiate with burial in the church cemetery. Visitation will be held on Thursday, April 28, 2005, at the RICHARDSON-STAFFORD FUNERAL HOME, Spring Green, from 5 p.m. until 8 p.m., and at the church on Friday from 10 a.m. until the time of service. The Richardson-Stafford Funeral Home is assisting the family with the arrangements. Married Name 3 July 1980 As of 3 July 1980,her married name was Snowadzki. Brenda Lee Gruber was born on 26 March 1957 at Plain, Sauk, Wisconsin. Brenda Lee Gruber died on 31 March 2004 at age 47 Brenda L.
Snowadzki, age 47, of Plain, passed away on Wednesday, March 31, 2004, at the Greenway Manor Nursing Home, in Spring Green, following a long illness. She was born on March 26, 1957, in Plain, the daughter of LeRoy "Sam" and Delores (Johnson) Gruber. Brenda was married on July 3, 1980 to Gary Snowadzki and was a member of St. Luke's' Catholic Church. After high school she went to California and worked at Camp Pendleton Marine Corp Base where she met her husband, Gary, of 24 years. Brenda and Gary moved to Plain in 1982, and managed "Sam's Place" in Plain until 1994, and she worked for over 10 years at Heartland Credit Union in Madison. Brenda loved fishing, bowling and gambling. She was a loving mother, friend and companion that will be greatly missed by all who knew her. Survivors include her husband, Gary Snowadzki of Plain; a daughter, Sadie Snowadzki and fiance Tom Hooks of Loganville; two sons, Andrew and Leslie Snowadzki of Plain; her mother, Delores Gruber of Plain, and friend Ed Vodak; two sisters, Barb Gruber and Walter McMillan of Baraboo, and Christine Gruber and Mike Gratz of Plain; a brother LeRoy (Diane) Gruber of Plain; two sisters-in-law, Candace Corral of Plain, and Kathi Vlahos of Crown Point, Ind; four nieces, Patricia Vlahos and Hailey, Hannah, and Samara Gruber; five nephews, Michael and Dan Gruber, Anthony Corral, and Ted and George Vlahos; and other relatives and friends. She was preceded in death by her father, LeRoy "Sam" Gruber on March 22, 1995; a brother, Daniel Gruber; her paternal grandparents, Bill and Christine Gruber; and her maternal grandparents, Alvin and Alma Johnson. A Mass of Christian Burial will be held on Saturday, April 3, 2004, at 10:30 a.m. at ST. LUKE'S CATHOLIC CHURCH, in Plain. Father Mike Resop will officiate with burial in the church cemetery. Visitation will be held on Friday, April 2, 2004, at the RICHARDSON-STAFFORD FUNERAL HOME in Spring Green, from 5 p.m. to 8 p.m. and on Saturday at the church from 9:30 a.m. until the time of service. The Richardson-Stafford Funeral Home is assisting the family. Dan Gruber was the son of LeRoy Gruber. Dan Gruber died before 2004. 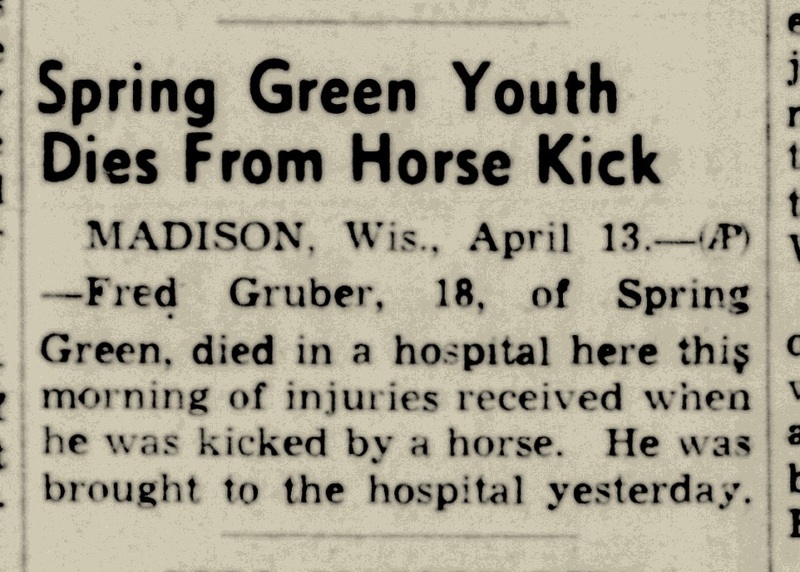 Name Variation Michael Gruber Jr. was also known as Michael J.
Michael Gruber Jr. was born on 19 April 1887 at Wisconsin. Michael Gruber Jr. married Mary A. Pletzer, daughter of John Pletzer and Margareth Ring, circa 1909. Michael Gruber Jr. died on 16 June 1964 at age 77. [S244] U.S. Federal Census 1910 U.S. Federal Census, by Ancestry.com, ED126. Dwelling 92. [S250] U.S. Federal Census 1930 U.S. Federal Census, by Ancestry.com, ED34. Dwelling 78. Married Name before 1935 As of before 1935,her married name was Mueller. Mary Margaret Gruber was born in 1912 at Wisconsin. She was the daughter of Michael Gruber Jr. and Mary A. Pletzer. Mary Margaret Gruber married Wilbert H. Mueller, son of Francis Xavier Mueller and Alice Helen Josephine Beaver, before 1935. Mary Margaret Gruber died on 7 February 1967. Edward J. Gruber married Alfrieda Paulus, daughter of Albert J. Paulus and Caroline Haas. Edward J. Gruber was born in 1914 at Wisconsin. He was the son of Michael Gruber Jr. and Mary A. Pletzer. Edward J. Gruber died in 1984. Elizabeth Gruber was born circa 1916 at Wisconsin. Grace Alma Gruber was born circa 1919 at Wisconsin. Rosemary Gruber was born circa 1921 at Wisconsin. 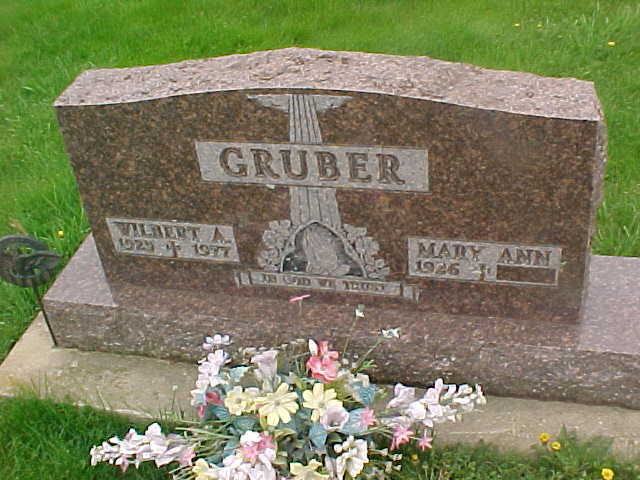 Elmer A. Gruber was born on 29 December 1928 at Wisconsin. Elmer A. Gruber died on 19 May 1975 at age 46. Name Variation Anthony John Gruber was also known as Anton John. Name Variation Anthony John Gruber was also known as Tony. Name Variation Anthony John Gruber was also known as Antony. Anthony John Gruber married Clara B. Soeldner, daughter of Joseph Soeldner and Kathryn Roth. Anthony John Gruber was born in July 1893 at Wisconsin. Anthony John Gruber died in 1972. [S243] U.S. Federal Census 1920 U.S. Federal Census, by Ancestry.com, stamp 227A line 44 Farm 67. ED178. Clara B. Soeldner married Anthony John Gruber, son of Michael Gruber and Frances Ruhland. Clara B. Soeldner was born in April 1897 at Wisconsin. She was the daughter of Joseph Soeldner and Kathryn Roth. 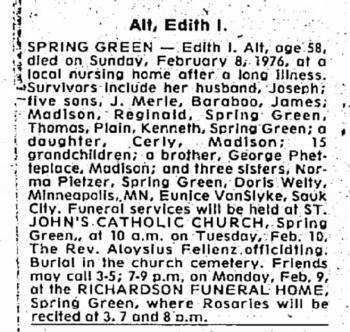 Clara B. Soeldner died in August 1950 at age 53 Mrs Anthony Gruber (Clara Soeldner) obituary. [S245] U.S. Federal Census 1900 U.S. Federal Census, by Ancestry.com, ED145. Dwelling 106. [S244] U.S. Federal Census 1910 U.S. Federal Census, by Ancestry.com, ED126. Dwelling 58. Name Variation Joseph A. Gruber was also known as Joe. Joseph A. Gruber was born in 1926 at Wisconsin. He was the son of Anthony John Gruber and Clara B. Soeldner. Joseph A. Gruber died in 1949. Fred J. Gruber was born in 1921 at Wisconsin. 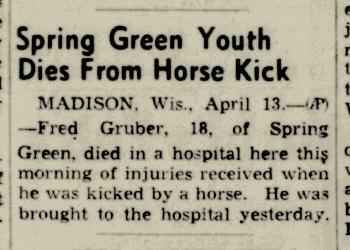 Fred J. Gruber died in April 1939 at hospital, Madison, Dane, Wisconsin, Fred Gruber death notice (kicked by horse). Joseph Soeldner was born in March 1869 at Germany. He was the son of (?) Soeldner and Thresa (?). Joseph Soeldner married Kathryn Roth, daughter of (?) Roth, circa 1893. Joseph Soeldner died in 1944. Joseph Soeldner immigrated in 1884. [S243] U.S. Federal Census 1920 U.S. Federal Census, by Ancestry.com, ED178. Dwelling 23. [S250] U.S. Federal Census 1930 U.S. Federal Census, by Ancestry.com, Year: 1930; Census Place: Spring Green, Sauk, Wisconsin; Roll: 2609; Page: 5B; Enumeration District: 34; Image: 439.0. Name Variation Kathryn Roth was also known as Ruth. Name Variation Kathryn Roth was also known as Root. Name Variation Kathryn Roth was also known as Katharina. Name Variation Kathryn Roth was also known as Kate. Married Name circa 1893 As of circa 1893,her married name was Soeldner. Kathryn Roth was born in October 1872 at Germany. She was the daughter of (?) Roth. Kathryn Roth married Joseph Soeldner, son of (?) Soeldner and Thresa (? ), circa 1893. Kathryn Roth died in 1952. Kathryn Roth immigrated in 1892. She had 4 with 4 living in 1900 children. She had 9 with 9 living in 1910 children. Name Variation Lucille Gruber was also known as Aunt Lou. Married Name May 1939 As of May 1939,her married name was Brey. Lucille Gruber was born in 1917 at Wisconsin. She was the daughter of Anthony John Gruber and Clara B. Soeldner. 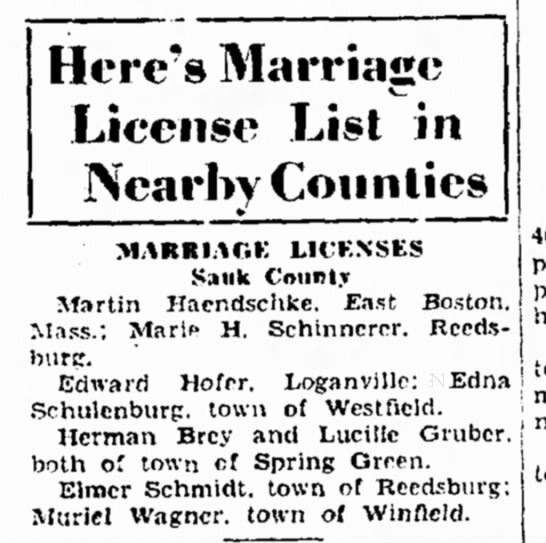 Lucille Gruber married Herman Brey, son of Arthur John Brey and Anastasia Brickl, in May 1939 Sauk county marriage license reported in The Capital Times on 07 May 1939. Lucille Gruber died in 1980. Name Variation Agnes F. Gruber was also known as Aggie. Married Name 30 January 1940 As of 30 January 1940,her married name was Blau. Agnes F. Gruber was born in 1919 at Wisconsin. 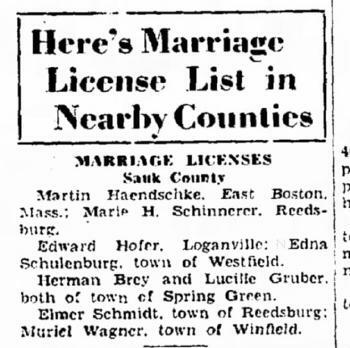 Agnes F. Gruber married Edward J. Blau, son of Joseph Michael Blau and Catherine Alt, on 30 January 1940 Sauk county marriage license reported in The Capital Times 28 Jan 1940. Agnes F. Gruber died in 2002. Married Name 25 September 1954 As of 25 September 1954,her married name was Louis. Clara C. Gruber was born on 1 November 1931 at Spring Green, Sauk, Wisconsin. Clara C. Gruber died on 14 October 2004 at age 72 Clara C. Louis, age 72 of Spring Green, passed away unexpectedly on Thursday, Oct. 14, 2004, at St. Marys Hospital in Madison. 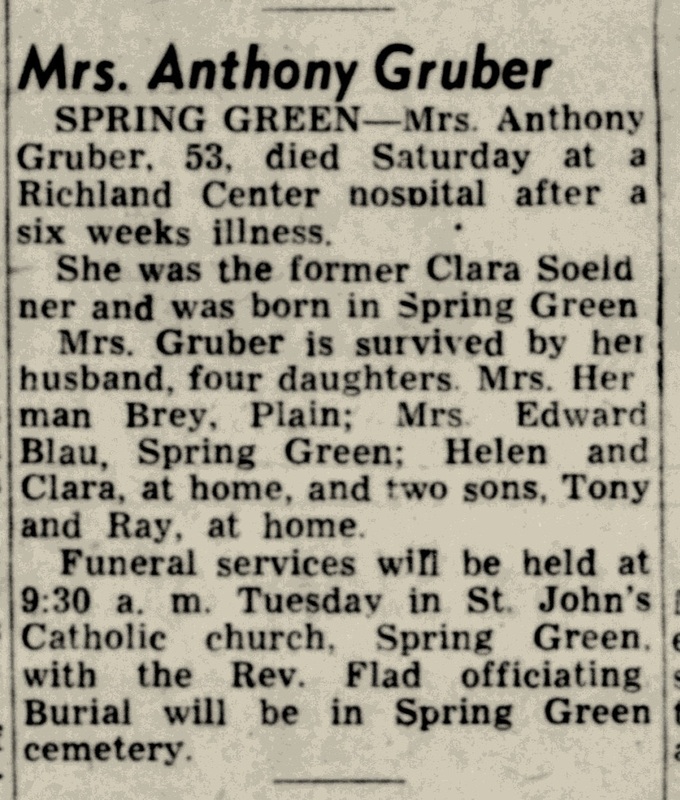 She was born on Nov. 1, 1931, in Spring Green, the daughter of Anthony and Clara (Soeldner) Gruber. She was married on Sept. 25, 1954, to Victor F. Louis. Clara was a member of St. John's Catholic Church in Spring Green, and enjoyed bowling, card playing, gardening, lawn care, cooking, baking and spending time with her grandchildren. Clara and her husband, Vic ran the Louis Shell Station in Spring Green, for 22 years and Clara continued to manage the store for the past 21 years. Survivors include a son, Joseph (Barbara) Louis of Spring Green; a daughter, Jean (Bob) Beckel of Savage, Minn; seven grandchildren, Jeffrey, Daniel, Steven and Marcus Louis, Lisa, Shannon and Tori Beckel; a brother, Tony (Marlene) Gruber of Spring Green; a sister, Helen Jax of Gotham; a sister-in-law, Donna Gruber of Spring Green; and many nieces, nephews, other relatives and friends. She was preceded in death by her parents, Anthony and Clara Gruber; her husband, Victor Louis on Jan. 11, 1982, three brothers, Fred, Joe and Ray Gruber; two sisters, Lucille Brey and Agnes Blau. A Mass of Christian Burial will be held on Tuesday, Oct. 19, 2004, at 11 a.m. at ST. JOHNS CATHOLIC CHURCH in Spring Green. Father Mike Resop will officiate with burial in the St. John's Catholic Cemetery. Visitation will be held on Monday, Oct. 18, 2004, at ST. JOHN'S CATHOLIC CHURCH from 4 p.m. until 8 p.m. and on Tuesday from 10 a.m. until the time of service. The Richardson-Stafford Funeral Home is assisting the family with the arrangements. In lieu of flowers, memorials may be made to the St. John's School Endowment.